The Hippogriff among us… You can’t prove a negative? Yes I bloody well can! This almost bent my brain out of shape. Philosophy 101 eh? It’s been a while! Looking forward to reading some more! You know I’m not sure if it’s 101 or not.. I am a first year Philosophy student, we have not covered anything like this yet though. This was an interesting read for me. I have a bunch of atheist friends who when they respect their own views and please mutually accept my views are different we got along fine and groovy.but i really resent being attacked by those who feel the right to judge me. I am a little polytheist pagan girl and am quite content in my own beliefs. Equally important as difference among dogmas i feel people as a whole should value and respect religious differences. Many important core religions share similar concepts of love joy peace and abundance. Thank you for your post. I found it a touching relief on why we shouldn’t judge one another so harshly. Different beliefs should be embraced and enjoyed! Cheers! Thanks for commenting.. I do not respect peoples right to form religious groups at all.. I do respect, well I am aware of religious differences, but that is not of issue here. Atheism is not a religion so it is not a difference of religious opinion at all. Have you considered that the reason these belief structures are all so similar is they have all evolved the same way, from us and our moral evolution? I do embrace realistic beliefs but in terms of God and religion I could as easily tell you I worship the tooth fairy and expect you to take me seriously. I blog to provoke thought, I’m glad it has. well you must not be offended then if i reply i worship the easter bunny and tooth fairy both and not as a simple joke? That saves me. Thanks for being so seibsnle! My experiences have shown me that the heart is mightier than the analytical mind. Look at Gandhi’s life and all the great sages down through time. Yes, I agree that following a religion of any sort is a bit stupid, but kindness and courage are not. So, if it leads you there, that’s not such a big problem. 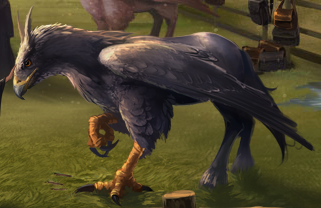 BTW I love the picture of the Hippogriff. For me imagination is more important than most other things. Thanks for stopping by. The proving of non-existent “facts” flies in the face of everything modern civilisation and logic has come to understand as the way stuff works. If you child comes to you and says “I got an A in my paper and you can’t prove otherwise,” it’s not considered poor taste or bad behaviour to ask to see the paper. Medicine, science, the justice system… everything works in the exact opposite way to how we’re meant to politely accept that religion works. “Oh, but it’s all about faith…” Uh-huh. Faith and “observable truth” – yeah, I’m certain that basketball team prayed so much longer than their opponents and are just generally more holy people and THAT’S why God chose them to win. Good job. I recently watched a BBC series about the Spanish Armada of 1588 and was especially fascinated by King Philip of Spain who believed utterly in God’s approval of his plan, in spite of the outright incompetence of his fleet’s admiral and the absurdity of the plan. What really span my head was how, even after Philip got thoroughly spanked – not just by the English, but by the weather, the tides, disease, incompetence, poor technology and just crappy luck, HE STILL BELIEVED THAT GOD WAS ON HIS SIDE. “It is impiety, and almost blasphemy to presume to know the will of God. It comes from the sin of pride. Even kings, Brother Nicholas, must submit to being used by God’s will without knowing what it is. They must never seek to use it.” said Old Phil to the proponents of the Protestant religion – before using exactly this logic to “prove” that God was sporting Spanish colours. He was so certain of God’s will that he sent another Armada, which didn’t even reach England – it was totally scuppered by the weather. Given that, back in 1588, the weather was generally accepted to be God’s domain, you’d think Religious Old Phil would have perhaps decided that, maybe, God had other plans for him? But, nope because “It is impiety etc etc…” but was God on his side? Of course! So he sent YET ANOTHER Armada after that one, which ALSO failed to reach England because of the bad weather. So, after three Armadas utterly failed (and not because the English had their crap together), did Philip ever question the “fact” that God has his Catholic back? He died at the age of 42, cancerous, with gout and respiratory problems; young(-ish), in enormous pain and unwaveringly certain of God’s support. Nearly 450 years on, we’re still seeing the same kind of behaviour from religious types who cannot separate “truth” from “desire”. It was God’s will that they won that award or passed that test or beat the other team. Can I prove that it wasn’t? Probably not to any kind of a degree that they’d accept, and all because of Philips “It is impiety…” speech. But can the religious prove their certainty in God’s will? I’m sure, like Philip, they reckon they can, and still using the same “It is impiety” logic as if it can flex both ways – to prove AND disprove God’s intentions. 450 years of religious progress, right there. I agree you can definitely disprove a negative beyond reasonable doubt. It’s difficult to say if this applies well to god/gods/deities/whatever because they are often considered non-physical, so it sort of falls outside of the realm of natural investigation. It makes the idea of a supernatural something practically unfalsifiable. However, I would argue, it’s not really worth believing in something unfalsifiable or taking such a thing seriously. If something is designed in such a way that it can’t be disproved it’s probably a sham or, at the very least, irrelevant. Note, I’m only talking about there being some supernatural something. I think we can pretty well disprove the idea that there is a personal god that interacts with humans. If such a thing existed, we should have been able to observe it by now. I wince whenever I hear an atheist say “You can’t prove a negative.” What, I can’t prove that there’s no elephant in my kitchen?! I think you’ll find I can…. regarding the Spanish Armada bit, let us not forget that in World War I God was on both sides. You can easily prove, for example, that positing a cause for the existence of the universe requires positing the existence of something other than the universe, or that the events described as “miracles” in most world religions would indeed be miraculous: which is to say, that they would require external causes. Less straightforward to provide supporting evidence for the claim that the universe exists for no reason and that nothing exists outside of it. From that direction you pretty much hit an impasse- agnosticism is the only possible conclusion. So the real crux of it isn’t there. The real crux of it is- which standard should we apply to our uncertainty? I frigging love love LOVE this! But I have a picture of my imaginary friend with his heart in his hand and a cross planted in the top. I’ll bet you’re one of those people who doesn’t believe in Atlantis power crystals either. These look so yummy! I want to prkema-e the empanada dough discs for a party. Can they be frozen ahead of time? I plan to put freezer paper between the layers. Miranda Lawrie – I would love the 40 pocket Picture Pocket. I would fill it with photos of my brtoehr, sisters, and nephews, who are spread over China, the UK, and the US. This will help our kids to grow up familiar with the faces of family far away.